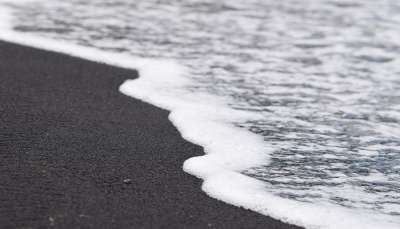 While white-sand beaches are lovely and all, black-sand beaches turn things up a notch – and make for a mighty fine photo! Formed from volcanic minerals and lava fragments, these beaches are much rarer than those with white sand – but are no less striking! Here’s a few of our favourites. 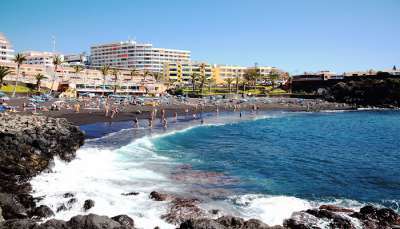 Boasting blue-flag credentials, and a reputation for being as laid-back as it is clean, Playa de la Arena is a quiet alternative to Tenerife’s Playa de las Americas. Surrounded by craggy rocks, fringed with palm trees, and with azure ocean stretching as far as the eye can see, this is a black sand beach worth the flight. There are also plenty of restaurants nearby dishing up all manner of cuisines. Okay, we know that Iceland isn’t exactly a popular beach destination, but bear with us. You probably won’t want to swim in the brisk waters of Vik Beach, but it sure is beautiful to behold! 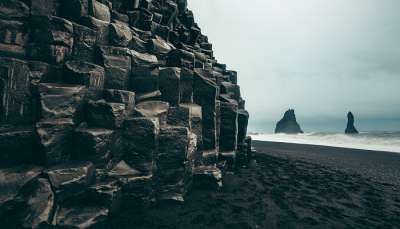 Located near the biggest town in the south of Iceland (population: 300), it’s famous for the basalt columns rising from its black sand – the columns are said to be the stunned remains of two trolls. Pull on your wetsuit and head to this magical black sand beach on the north-west coast of New Zealand’s North Island. 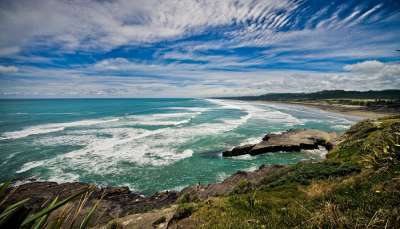 The cliffs that tower above the sand are hugged by a boardwalk offering sweeping views of the Tasman Sea. And with some of the island’s most popular waves for surfing, this is a must-visit whether you’re into surfing, hiking, or even just taking in the scenery! Its black sands starkly contrasting with Santorini’s famous whitewashed buildings, Monolithos Beach is one of the island’s best kept secrets. The spotless sand is sandcastle-building heaven - and it just happens to be one of the only beaches on Santorini where you’re allowed to build a sandcastle! Much quieter than the island’s other beaches, you won’t struggle to find a patch of sand, or get a table at one of the nearby restaurants. Tired of 24-hour party scene of Kuta? Head north to Lovina Beach, a 12-kilometre stretch of black sand, vibrant palm trees and gently rippling waves. The waters off the coastline are renowned for dolphin spotting, so try and nab a spot on a boat to get a glimpse. Visit one of the nearby small villages for local rice speciality nasi goreng, before heading into the water for some of the best snorkelling the island has to offer. 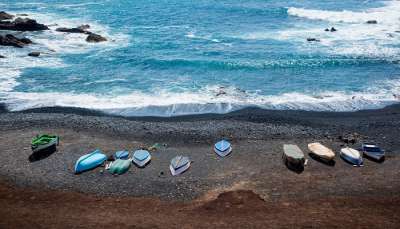 Ribeira Brava Beach on the subtropical island of Madeira offers a swathe of black sand and shingle that only makes the blue water lapping at its shores all the more striking. The beach also plays host to a range of activities. We’re talking sandy areas primed for volleyball and football, canoes for hire and a children’s swimming pool. Oh, and did we mention the many bars and restaurants perched right behind the sand enticing beach-goers? 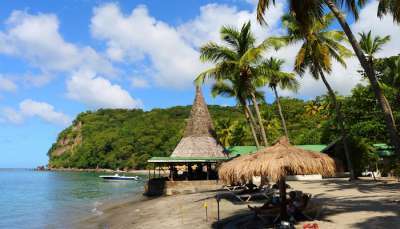 The island nation of Saint Lucia is lovely, and Anse Chastanet Beach only doubles down on that loveliness. With its crystal-clear waters seemingly created purely for snorkelling and surrounding jade peaks towering above you, the black sand only adds to the dramatic appeal of this beach. While the road getting down there is a bit rough, it’s well worth it for the on-beach restaurant and tip-top snorkelling right off the shore. Stumble into this exotic slice of the Caribbean island of Grenada, and you’ll be well rewarded. 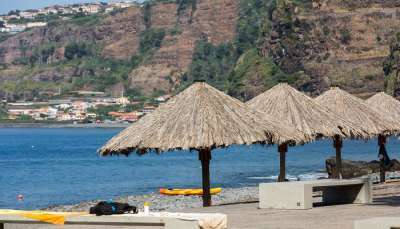 This rugged patch of coast is hidden from the outside world by wild jungle, and requires a walk over bridges and through banana plantations to reach its black sands. With a cave at one end, abandoned buildings lining its small shore, and few other humans in sight, it’s pretty much the definition of an ‘escape’. There’s a hill separating Praia Moinhos from the small strip of restaurants and hotels that sits behind it. Walk through the tunnel that connects them, and you’ll be greeted with onyx sand, towering cliffs covered with verdant vegetation, and some pretty spectacular water. 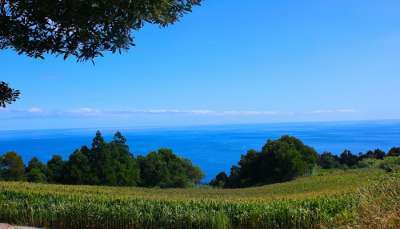 On the Azores island of São Miguel, it’s just a small parcel of the natural beauty the Portuguese archipelago has to offer. Emerging from the ocean as a result of a volcanic eruption, it’s not surprising that the Canary Island of Lanzarote is home to a number of volcano-related sites. A cluster of small black-sand and pebble coves, Playa Quemada is protected from the strong winds that make their presence known on nearby beaches. With nary a sky-high development to be seen, it’s also an idyllic escape from the crowds. A few restaurants nearby sell seafood that’s practically still dripping with seawater.